Hard Carved Doves – Fr. Phil met master woodworker Biguel Fall on a visit to Dakar, Senegal, in 1995. Biguel owned a woodworking studio there and made incredible works of art with the most rudimentary of tools. The parish began sending him advanced machinery and he hired dozens of workers. 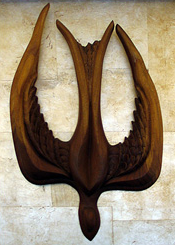 As a thank offering, Biguel created the African Rosewood Dove gracing our Narthex. He also made the Christus Rex, The Reigning Christ figure displayed in Church. About when we were figuring out the furniture for the new church in 2000, Biguel emigrated to the US, becoming a US citizen (his Dakar Studio still going strong). He lived with the Emmitts and worked out of garages, first at the Karlo’s across the street, then at the Bierwirth’s, just down the street. Everything made of wood in our church was created by Biguel Fall. Other then the old Altar, everything; pews, platforms, nave cross (the thick White Oak planks donated by the Higgin’s). Parishioners stained and finished most of the wood! Biguel is foreman of a cabinet shop, living in Jersey City with his family. He still carves on the side. He is offering small hand carved Doves and we are pleased to continue our support of Bigual and his family. They are hand carved and therefore of some cost. See Fr. Phil if interested. A sample is found near the main dove. To know Christ as we serve others, proclaim His love, and grow in His Spirit.